When musical luminaries collaborate the results are often mixed. Sometimes, as with Sinatra’s late career Duets projects they can be downright dreadful. But then there are projects that regardless of how they came about sound organic and real. 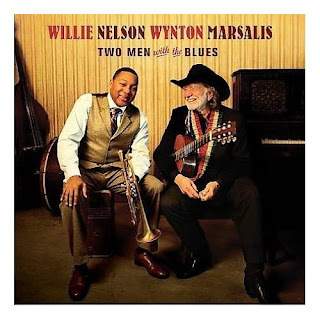 Thankfully the collaboration between Willie Nelson and Wynton Marslalis is a case where the whole is greater than the sum of its parts. Each of their resumes is chock full of not only successful endeavors but respect from their musical peers which is often the most impressive sign of musical accomplishment. Country and Jazz are two musical idioms which can be claimed as coming from the United States. This collaboration has the benefit of two men at the top of their fields in each of those genres. Last year they played at Lincoln Center where Wynton is the Artistic Director. Though it had been billed as “Willie Nelson Sings The Blues,” it was in reality collaboration between two behemoths in their respective fields. The two-night collaboration was recorded and turned into the album Two Men With The Blues. The tunes on the album run the gamut from standards like Georgia On My Mind to the Jimmy Reed classic Bright Lights Big City, which acts as the opener. Other highlights include Clarence Williams My Bucket’s Got a Hole In It, and Willie’s own Rainy Day Blues. Blues, Jazz and Country sounds come together to form a wonderful homemade musical stew. Throughout their performances they weave a fine line between showing off the impressive musical chops they share with their backup band to seeming as relaxed and natural as if they’re playing a backyard picnic for some friends. I can only hope that at some point they decide to hit the road together. If they do, it’s likely to be a show not to miss. For now though this album is a terrific slice of Americana to seek out if you're a fan of either of these men.